blue.zener demonstrates some handy Linux UDEV foo that assigns the Bus Pirate to /dev/bus_pirate, instead of the boring /dev/ttyusb. This can be used to give any device a more memorable name under Linux. 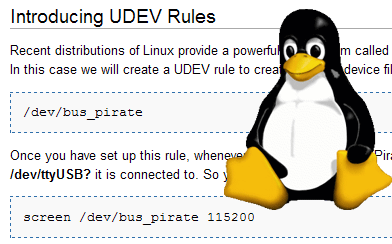 This entry was posted on Friday, October 16th, 2009 at 6:32 am	and is filed under Bus Pirate, Linux. You can follow any responses to this entry through the RSS 2.0 feed. You can skip to the end and leave a response. Pinging is currently not allowed.